Abilene, like many other towns in Texas, was born from the railroad. After the Texas and Pacific Railroad was built westward to Abilene in 1881, settlers began to arrive in this rural corner of Taylor County. Incorporated in 1883, the city was almost an entirely agricultural community, with a few scattered businesses and churches. Its humble beginnings belied the railroad’s marketing campaign which dubbed Abilene as “the future great city of West Texas.” Jews have been an active part of Abilene almost since the very beginning. Downtown Abilene, where most Jewish merchants had their stores. The first Jews to settle in Abilene were brothers C. and I. Goldberg, who came in 1883. They were Russian immigrants who owned a general merchandise business, though not much else is known about them. A few years after their arrival, they relocated to Oklahoma. Only a few other Jews came to Abilene in the late 19th century. One of them, Sam Lapowski, was a Pole who had immigrated to the United States in 1869. In 1884, he came to Abilene from San Antonio to sell goods. He decided to stay in Abilene and soon opened a clothing store on Pine and North First Streets. In 1901, the family legally changed their last name to Dillon. Lapowski and his wife Bertha were influential citizens in Abilene, though they left for El Paso in 1904. Their son Clarence, who was raised in Abilene, became a Wall Street investment banker with his prominent firm Dillon, Reade & Co., becoming one of the richest men in the country. His son, C. Douglas Dillon, was the U.S. Ambassador to France from 1953-1957 as well as Secretary of the Treasury under President Kennedy. During the early 20th century, a handful of Jews called Abilene home. Ben Cohen, who came to the United States from Russia in 1906, started out peddling in the region. In 1909, he moved to Abilene and established the Texas Hide and Metal Company and later a dry goods store called the Boston Store. He married and remained in Abilene until his death in 1932. S.A. Friedman and Nathan Landau were in the dry goods business as well, opening a store on Chestnut Street. They also were real estate developers, building two of Abilene’s first motels, Landau Courts and Selma Courts. George Finberg, a cotton broker, and Hyman Walkow were also some of the city’s first Jewish residents. Although they were small in number, Abilene’s Jews were very active in civic life. Finberg was president of the Abilene Chamber of Commerce from 1914 to 1916. Walkow was commander of the local Veterans of Foreign Wars while his wife Esther was president of the Travis Elementary School PTA. By 1926, Abilene’s population had swelled to 10,000, though this included just seven Jewish families. Henry and Sarah Weltman arrived in the U.S. in 1922 from Poland, settling in Wichita Falls, Texas. There, Henry found a job at a local department store. When Sarah’s cousins heard that a dry goods store in Abilene was for sale, they lent the couple $10,000 to purchase the store. The Weltmans moved to Abilene in 1926 and operating the store for five years. They later opened a dress shop which was in business for 46 years. Max Mellinger came to the U.S. through Galveston in 1905 from Slovakia. In 1914, he relocated to Johnson City and opened a dry goods store. There, he lived next door to the parents of Lyndon B. Johnson and claims to have sold the future president his first pair of trousers. Remaining friends with Johnson throughout his entire life, Mellinger and his wife Sally moved to Merkel, just outside of Abilene, where he bought a dry goods store. He operated the store until his death in 1970. Other Jews who found their way to Abilene in the 1930s were Harry and Sadie Goltz, owners of men’s furnishings store; Max and Mary Elias, who ran a scrap metal business; and brothers Harry and Jack Belsky, operators of the shoe department in Minor’s Ready to Wear store. As late as 1937, only 42 Jews lived in Abilene. With such a small number of Jewish families in Abilene, they did not create a formal congregation or build a house of worship, though they did meet in private homes for occasional services. With no rabbi, different members of the Jewish community led services. For special occasions, they met at the headquarters of the local Woodmen of the World chapter. Hyman Walkow usually served as the cantor. However, this all changed in 1939. As World War II began and U.S. involvement seemed imminent, the U.S. government opened Camp Barkeley just 11 miles southwest of Abilene. Serving as headquarters for the 45th Infantry Division and as a German prisoner of war camp, it became one of Texas’ biggest military installations. With its opening, 30,000 people descended upon Abilene, including Jewish merchants and Jewish servicemen. Those who moved to Abilene following the camp’s opening included brothers Joe and Ivan Shoshone, who were the owners of Lester’s Jewelry Store, Nathan Stool, who opened an army store, the Caplan family, owners of a ladies’ store, and Clarence Solnick, who took over a ladies’ shoe department. With such an influx of Jews to Abilene, the Jewish community decided to organize a congregation. 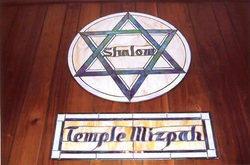 On July 23, 1941, Congregation Mizpah was formally established, with Meyer Mehl as its president. The group already owned a Torah at the time.“Mizpah” refers to an emotional bond between two people who are separated. It also refers to a coin that is divided in two when loved ones are apart, each person holding onto one half. With the war looming and families separating, the name made perfect sense. That year, on December 7, 1941, during a congregation meeting at the home of Fanny Cohen, a chaplain arrived to announce that the U.S. was officially at war after the attack on Pearl Harbor. The congregation decided that a synagogue must be built to accommodate the many Jewish servicemen who would soon arrive in Abilene. They were in a hurry, and quickly raised money to build a modest synagogue for the new congregation. Construction on Temple Mizpah started on July 24, 1942, and was completed just a month later. The small building, which was just over 1000 square feet, cost only $4,855. Half of these funds came from the Jewish community, while the rest came from Gentile citizens who believed that all servicemen should have a place to pray before heading overseas. At its August 30 dedication, Will Hair, mayor of Abilene, made the opening address and Episcopalian priest Willis Gerhart conducted the official dedication. During the war years, the congregation was quite busy. With a seating capacity of 250 in its sanctuary, services were always filled. Weddings were also frequent – on just one Sunday, for example, four took place. Mary Elias, president of the Ladies Auxiliary, attended every wedding at the temple. With so many couples away from their families, she and her husband would even walk the brides down the aisle. The Ladies Auxiliary was especially active in organizing events for Jewish servicemen stationed at Camp Barkeley. In 1942, the group served Rosh Hashanah and Yom Kippur meals for 250 and held a Passover seder for 500 on the first night and 350 on the second. In 1944, the women organized a seder attended by 1,180 soldiers. Preparing for two weeks, they ordered kosher meat from New York and Chicago, used entirely new dishware, and made 2,500 matzo balls. One mother of a soldier who attended a dinner wrote to Congregation Mizpah, giving her thanks “for making the holidays so much like home to them. It is hardly believable that so much can be done in so little a community.” In addition, the congregation organized the Camp Barkeley Hospital Committee, which brought gifts containing fruit, cookies, and stationary to wounded and ill soldiers, Jewish and non-Jewish. Though Congregation Mizpah was very active during these years, they were not able to hire a rabbi. Finally, in 1945, they found Rabbi Aaron Klausner, a civilian chaplain at Camp Maxey in Paris, Texas. He conducted the High Holiday services that year and returned to do so every year until 1994. The congregation has had a number of rabbis come to Abilene to conduct monthly services. These include Rabbis Sol Kaplan from Dallas, Ray Israel from Dallas for three years, David Jacobson from San Antonio for seven years, and Richard Dryer from San Antonio. Relying on these visiting rabbis, Temple Mizpah never had a full-time spiritual leader. In 1945, Camp Barkeley closed, and many Jews left Abilene, though the community remained larger than it had been before the war. After the city’s leaders aggressively lobbied for another base, Congress approved the opening of Dyess Air Force Base, just four miles west of Abilene, in 1952. This helped the local economy and brought many Jews back to Abilene. Most continued to concentrate in retail trade, owning stores in downtown Abilene. A handful were officers stationed at the Air Force base. By 1960, 105 Jews lived in the city. 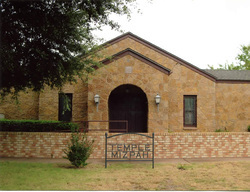 In 1957, Temple Mizpah acquired land in Elmwood Memorial Park for a Jewish cemetery. By 1970, the congregation, which had 28 contributing members, formally affiliated with the Reform movement. Most of the baby boom generation who grew up at Temple Mizpah moved away to larger cities, and the congregation shrunk slightly, dropping to 19 members by 1990. Despite this, the presence of the Dyess Air Force Base has helped ensure the vitality of the congregation. Today, Congregation Mizpah, made up of around 20 families, is a member of the Union for Reform Judaism and has a religious school. A visiting rabbi conducts services once a month. Abilene was created by the railroad, but did not reach its maturity until the arrival of military bases during World War II. It was the needs of these soldiers that finally inspired Abilene’s small Jewish community to organize and build a house of worship. This same military presence has helped Temple Mizpah continue on into the 21st century.